Bring the Mickey Mouse Club to Your Next Event! Description: One of our newest addition, the Mickey mouse clubhouse combo. This inflatable has both a jumping area and a slide that will surely entertain all of your guest. It is a fully themed mickey mouse clubhouse unit that has unique graphics in the front of the unit. 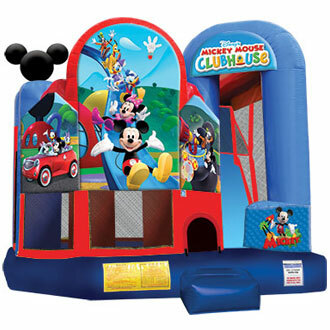 Call now to book this mickey mouse inflatable combo!